SNAFU! : China is building its 3rd aircraft carrier. China is building its 3rd aircraft carrier. 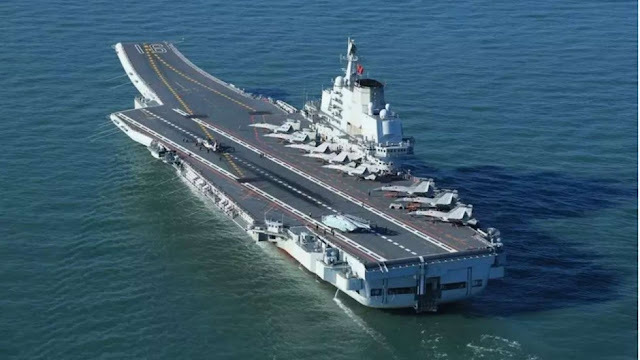 China started building its third aircraft carrier, with a hi-tech launch system, at a Shanghai shipyard last year, according to sources close to the People’s Liberation Army. One of the sources said Shanghai Jiangnan Shipyard Group was given the go-ahead to begin work on the vessel after military leaders met in Beijing following the annual sessions of China’s legislature and top political advisory body in March. China has been trying to build up a blue-water navy that can operate globally and support its maritime security, but it so far has only one aircraft carrier, the Liaoning – a repurposed Soviet ship it bought from Ukraine that went into service in 2012. Hmm. Other websites are adding that this ship will be smaller than the other two and have a two island layout like the Queen Elizabeth Class. Does anyone know the number of carriers China is seeking to field in total? Could this be a move to not only meet our forces on a quality vs quality basis but by building a number of somewhat smaller carriers, also beat us on numbers? Is this a weird blend of US Navy offensive operations (in the form of carriers) along with the Russian anti-access doctrine (fast missile boats, subs, and long range anti-ship firing bombers)? Do you know why I keep screaming that Russia isn't the enemy, that China is the threat? Because of moves like this. Look at the force that Russia is building vs. the one that China is! Russia is building a capable DEFENSE force. This is seen across the board from their land to naval to air force. China however is building an offensive capability that is designed to match our strengths and exploit our weaknesses. The longer we keep letting leadership distract us with the idiotic Russia threat the longer it will be till we can pivot to confront the real evil...the Communist Chinese!